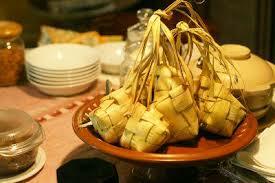 Ketupat is a type of dumpling made from rice packed inside a diamond-shaped container of woven palm leaf pouch. It is commonly described as "packed rice", although there are other types of similar packed rices such as lontong and bakchang. Ketupat is cut open, its skin (woven palm leaf) being removed, the inner rice cake is cut in pieces, and served as staple food, as the replacement of plain steamed rice. It usually eaten with rendang, opor ayam, sayur labu (chayote soup), sambal goreng hati (liver in sambal) or served as an accompaniment to satay (chicken or beef or lamb in skewers) or gado-gado (mixed vegetables with peanut sauce). Ketupat is also the main element of certain dishes such as ketupat sayur (ketupat in chayote soup with tofu and boiled egg) and kupat tahu (ketupat and tofu in peanut sauce). In Java and most of Indonesia, ketupat is linked to Islamic tradition of lebaran (Eid ul-Fitr). The earliest connection of ketupat with Islamic lebaran tradition is believed to be originated in 15th-century Sultanate of Demak. It is believed that it contains appropriate symbolism; kupatmeans ngaku lepat or "admitting one's mistakes" in accordance to asking for forgiveness tradition during lebaran. The crossed weaving of palm leaves symbolizes mistakes and sins committed by human beings, and the inner whitish rice cake symbolize purity and deliverance from sins after observing Ramadhan fast, prayer and rituals. 0 Response to "Ketupat Is Traditional Food for Celebrate Iedul Fitri"